• A brief historical look at America in the 1980s, from a Kindred perspective. • A Storytelling Adventure System story set in 1983 Chicago, complete with a pre-generated coterie. • A customized blank character sheet, and a black and white version of the full PDF for ease of printing. 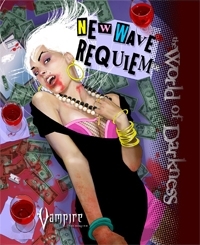 New Wave Requiem is a supplement for the World of Darkness game Vampire: The Requiem. This product was featured in an episode of the White Wolf Blogcast. This title was added to our catalog on February 25, 2009.